Kiltale GAA is a Gaelic Athletic Association hurling and camogie club based in Kiltale, in County Meath, Ireland, 23 miles from Dublin City. Kiltale is a small rural parish with a population of approximately 300. Kiltale is home of the European Union Food and Veterinary Offices and Grange, Teagasc’s Beef Research Centre. 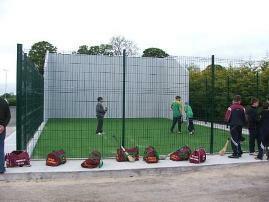 Kiltale Hurling and Camogie Club is by far the largest sporting organisation in Kiltale. We are a progressive and forward looking club and have enjoyed great success both on and off the field of play in recent years. As a club we strive to meet the needs of our entire community. Kiltale Hurling and Camogie Club together with the help of the entire community have been one of the most progressive clubs in Co. Meath. From humble beginnings we have to date, with everybody’s help developed the following facilities. The above development has been predominately funded by fundraising draws. Our draw in 2006 helped part finance the purchase of 6.5 acres of new community land. Whether you are into sports or just want to enjoy a quiet drink in the bar, come and savour the welcoming environment of Kiltale Clubhouse. There’s live music in the clubhouse every Saturday night, and the clubhouse is an ideal venue for parties. Our clubhouse is very much in demand for family gatherings such as surprise parties, 21st’s and christenings. Anyone who wishes to book the clubhouse for a function should contact the Bar Manager, Eamon Regan at +353 46 90 26565. This will involve the construction of two new pitches. Construction of a walking/running track around the new grounds. Fencing of the new grounds and floodlighting to make them operational all year round. We are offering family membership for €3.75 a week or €15 a month by direct debit or standing order into our account to helpFloodlights service the borrowings to complete these projects. A family would be adults and children who are school/college going and non-earning. To enquire about membership contact a member of the committee. Bingo every Tuesday night at 8pm in Kiltale Club House. All are welcome. Thanks to all who have subscribed to the pre-paid lotto. Your support and indeed the support of all contributors is very much appreciated by the club. If interested in prepaying for Lotto please contact Anne Gilsenan at 087-2875070 or Emer Lynch at 086-3583455. The best of luck to all entrants! Help Kiltale Hurling and Camogie Club by making a donation.